To celebrate the gorgeous ☼ weather I thought I would have a giveaway for my lovely followers, I've been enjoying Gosh products and thought I would select 3 of my favourite products- perfect for the Spring/Summer. 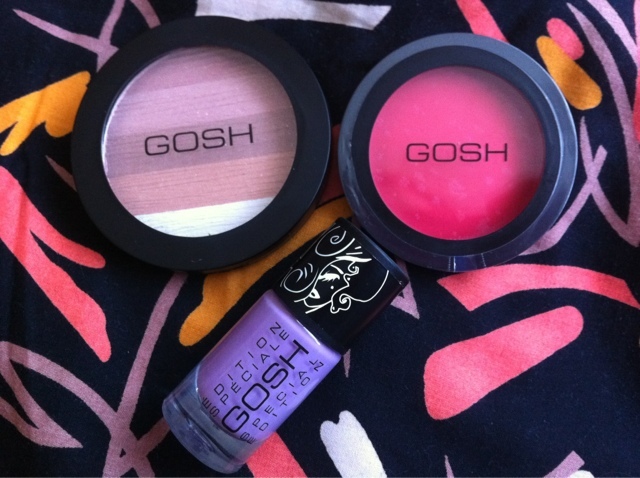 Gosh Shimmer Brick- Pink / Gosh Cream Blush- Lusty Pink / Gosh Limited Edition-Dusty Mauve. Please make sure you're a follower of Beauty In The Mirror to be in chance of wining this perfect trio! *Please leave a comment below telling what your top Spring/Summer makeup product is, I love finding new products to try. *Leave your email/twitter name so I can contact you, should you be the lucky winner. It would be great if you could follow GoshUK on Twitter and Facebook to keep up to date with latest product launches and looks. Followed on GFC and tweeted @BellaRobot. Best spring beauty products are definitely pastel nail polish (OPI Pink Friday and Nails Inc Haymarket) and Clinique Almost Lipstick. my favorite summer beauty item would be theBalm's blush in Hot Mama! such a pretty coral blush! I've just bought Vivo's Baked Bronzer and I love it, certain worth a try, especially since its only £4! My favourite product has to be some gorgeous bright nail polishes to match the sunny weather. I love Maybelline Forever Strong, shade 'Hot Salsa'. It's really easy to apply as it has a shaped brush and it dries really quickly. It lasts for quite a while too! My favourite Summer make-up product has to be bright nail polish to match the lovely weather. I love Maybelline Forever Strong in 'Hot Salsa', it's really easy to apply with a shaped brush, it dries really quickly and it lasts a long time! Thank you for this great giveaway. Good luck everyone! My fav product this spring is Sleek Makeup Face Contour Kit. Good quality and long lasting, great for defining my contours!! I have retweeted the original post. I have also posted on Facebook (Louise chung). Great giveaway good luck everyone. My top spring product is Sleek Makeup Face Contour Kit. Trust me you will love your cheekbones. @chunglouise. Also retweeted and posted on Facebook under Louise Chung. How do I follow GFC. A newbie still and very lost. Hello! I'm following you on GFC as @sjess82 & twitter as @sjess82 and I've tweeted your message. I am in love with Rimmels 1000 kisses lip stain & balm this spring/summer it makes my lips look full & kissable. My favourite product this spring is Sleek Makeup blush by 3 Lace. Good quality and nice colours! I'm really loving the ELF body glow it works great my Spring favorite so far . My top spring/summer product is a bright lipstick from Bourjois -- I have several but my favourite is the Sweet Kiss lipstick in Rose Corset. My Twitter handle is butterfly494_. My favourite spring/summer product is a bright lipstick from Bourjois -- I have several but my favourite is the Sweet Kiss lipstick in Rose Corset. I love nail polishes in the summer and spring. Especially China Glaze's light blue polishes. My favourite spring/summer product is Effet Miracle Bare Skin Perfection Primer it gives a lovely flawless finish and dewy complexion. my favourite s/s has to be new nailpolish! am loving all the peaches that even work with my pale complexion! Collection200 fruit loop is my favourite!! Oooh lovely giveaway huny, thanks so much for holding, would love to be entered! I've actually found a new fav spring/summer product, its ELF Shimmering Facial Whip in Lilac Pearl that I received in a swap. Such a pretty creamy highlighter that gives the face such a lovely dewy glow! Really nice! My fav product for spring is Mac springsheen blush. Lovely for a spring look. I'm a follower with GFC, and I tweeted the giveaway as well! my favorite summer beauty item would be Coral shade lipstick by NYX..